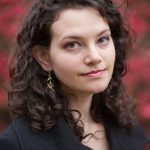 Courtney Sender’s fiction has won the Glimmer Train fiction open, The Mississippi Review fiction contest, and the Boulevard emerging writers contest. Her stories also appear in The Kenyon Review, AGNI, American Short Fiction, The Georgia Review, Slice, and others. A MacDowell Colony fellow, she holds an MFA from the Johns Hopkins Writing Seminars. She currently teaches at Grub Street in Boston and studies at Harvard Divinity School. So God created mankind in his own image…male and female he created them. It’s true my name is Lilith, known to history as the spurned first wife of Adam. But what story is as simple as a single sentence? He was no bargain, and let’s not imagine he didn’t suffer for the loss of me. That woman Eve—you think she didn’t have a first love, too? Among us all, only Adam was unlucky enough never to see his love returned. My poor, cruel, inelegant, lonely Adam. So the story goes: I am Lilith, made of the same earth as Adam. Made of half his soul. Made of mud, bone, flesh, spirit, demon, word, story, stone, loss, longing, virtue, sin, forbearance. Made of everything, except a rib. The truth is, I don’t remember my creation. I know only which tale I prefer: the one where God scooped me and Adam in his big hands, in his right the clay that would be Adam and his left the clay that would be me. (Or vice-versa—God has no heart, so why fight to be closest to it?) He clenched his fists, our torsos in his palms, and in the cracks between his knuckles Adam and I took shape: feet hooked on one side of his fist, chests heaving up between the second and third fingers, chins craning from under the thumb. I remember the feeling, squeeze and relief. Like birth. Lilith is said to hate children—but only insofar as I know they’ll have to suffer. Some of them will be Lilith, some Eve, some Adam. Beloved, besotted, bereft. I had no mother, after all. Nor did Adam, nor Eve. Maternal love is natural or it is learned; we had no chance to learn it. When it comes to hate: I hate no more than any mother hates her reckless idiots, smiling at the hearts that will undo them. We were both Adam, at first. Adam meaning earth. Meaning man. We had identical bodies. God called us by one name, and we came. It is history’s Adam who first suggested Lilith, in the smoldering dark with his hand cupped over the rise of my hip. He sang to me, a wordless tune. It was a way of calling me, but it wasn’t until later that I realized it could be my name: La la. My favorite memory of Adam is there, right there, the buzz of his throat against my throat, his thrumming music in my ear. The leaves of paradise soft beneath us both. His eyes like mine, his skin like mine, brown and rich and the same as the earth. I couldn’t tell us apart sometimes, except I knew that he was singing and I must not be. La la. Love was different then, before choice. It was the same thing as hate. There was only one thing, and I called it that thing I feel for Adam, and he called it the same, and we had the gift of naming, and we named it love. Of course, I didn’t know that at the time. I talked myself hoarse to him. He sang me the lullabies that lovers sing—but that is only because we’d named ourselves lovers and the songs lullabies. We might have called them claws instead, and us foes. Then we’d have been foes clawing at each other, nonetheless inside the melody of an easy sleep on hallowed moonlit earth. If I’ve stressed this name point strongly, it’s because I am angry at God for offering the wrong kind of language. What we want are heartwords, mindsongs, but we were given only throatwords and mouthsongs to explain them to each other. This is all to say that Adam and I loved each other, and I didn’t know love meant a different thing to him than it did to me. I would not have asked God for a different Adam, not in a thousand thousand lifetimes. But he asked for a different Lilith. Here there’s been some misinterpretation. We speak now of rib, but the truth is breast. Both our chests once rose into the negative space of God’s fist; now, Adam’s went flat. As God was reaching into Adam, to rip him open and undo my twin’s elegant body, I happened to walk into that bloody clearing with a handful of berries. In later years, I have discovered that I hate the chore of picking berries. I didn’t know it then, because I was picking berries for Adam. And there was blood, and there was God, his arm in the base of Adam’s torn-out throat. I screamed. I raced to kill God, to protect Adam, and in his fright God pressed a finger so deep inside Adam that he pushed his organs out between his legs. To this day, the womb replicates this accident: the baby starts off female: this was the form of humankind, before God the sculptor blundered in his shame at knowing what he was doing and being caught by Lilith. “I’m sorry,” said God, “I’m so sorry,” and he placed Eve on the earth that had made me. Her body was slick with Adam’s blood. The grisly scene looked grislier because I’d crushed the red berries in my fighting fists. In lonely years since, I’ve wondered whether I just wanted to be created again for Adam, too. Adam’s skin was pale and glistening redly. He staggered to his feet. “Who said that you could do this?” I asked God, trying to reach him, to beat him. God backed away. He pointed. I followed his finger, around which Adam and I had first gasped breath together toward our lungs. I stared into my Adam’s muddy eyes, willing him not to have requested this other wife. He looked guiltily at the ground. Much has been written of the Garden of Eden. Let me tell you something about Paradise: it is hellish as Satan’s memory, when the person you love there doesn’t love you. Now, we invented new words: Passion. Apathy. Desire. Disdain. My hateful Adam adored her from the very start, with all the depth of love that he could cull from his hollow chest. He trailed her through the paths of Eden. He never sang into my ear again. “La la,” Eve called in the middle of the night. “La la hush,” she whispered, her breath buzzing at my throat. Her mouth traced down my full heart and paused over the contained organs that Adam had lost to disdain me and desire her. Her eyes flicked like a serpent’s up to mine. “Lilith,” she mumbled, her tongue between her teeth. Adam found out soon enough, of course. There are few places to hide in a sprawling sunsoaked garden. He hovered silently over us and I lay awake on my back, studying him. The sheen in his eyes, I had learned, did not mean a thing. It did not mean the same thing as the sheen in mine. We’d had lovely nights together, he and I, cradled on Eden’s soil. We’d had to call each other nothing, when there was no one else to call. Beast. I felt a painful swelling start at the base of my throat. The story goes that Adam named them, the beasts of the field—but all it means is that he named me. When he stopped wanting to sing to me, he started speaking, and his words were ugly. “I don’t want to talk,” I murmured, wanting him to ask again. He pulled Eve out from under my arm. “You love talking!” he said. Idiot boy. What I’d loved was talking to you. Adam sent me away from Eden, and I left. It didn’t matter where; two loves lost, no place could be a paradise for me anymore. Eve watched me go. She watched my hips sway as I performed a steady gait away; she watched my calves sway as I couldn’t manage it. She watched my cheeks burn as I looked back at Adam, and she watched my eyes fill as I saw him watching her. She watched my knees buckle as I collapsed one last time into the earth of paradise, the closest I’d ever again be to Adam. She watched me press my face into the dirt. She may have watched me swallow a mouthful of soil. She watched me right myself and leave the garden, but this was a time before knowledge: she could not predict where I’d go. Eve was a brilliant woman, made of the best of Adam and me, and now she was a broken woman. Her love went somewhere she couldn’t follow, beyond the garden’s gates—can you blame her for finding the forbidden fruit that very hour, and banishing herself where she might find me? Brilliant, broken, brazen, brave. These are words that Eve and I made up together. These are our words, women’s words, words we chose for the beginning of a wandering world. The story that comes next has been rewritten. Of course it’s been rewritten; Eve is first woman because she was first mother, that’s all. It is her sons and theirs who wrote the story. Let me tell you: Eve didn’t care if Adam ate the fruit. She left it in the sun to rot. She was already halfway to the garden’s gate when he came running, spitting appleseeds. I’m told that she did not look back to greet him. Do not pity me, though I am Lilith, the scorned first wife of Adam. I have had my years for pity. I have taken the name given by the woman willing to take me. I have not won, but I have not lost. I have grown content. I worry sometimes that my heart is turning cold, from lack of someone to give myself to, but then Eve wanders into me and I pour out as much love as I can before she leaves. I redefine love by the day, the moment, the place I’m at in the story I’m telling. God sometimes visits, to apologize. I send him away. It is not so bad. A man’s word, pity. If you must use it, then pity Adam, who could not learn to love what loved him: boneless Adam, broken Adam, Adam of the earth, Adam singing, Adam of the space inside God’s hands.